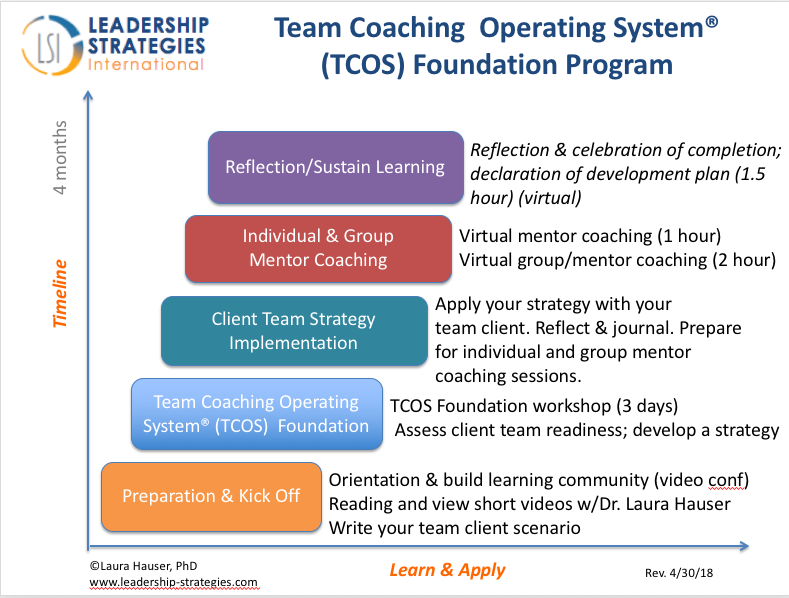 Introducing the Team Coaching Operating System℠ (TCOS). It is based on Dr. Laura Hauser's pioneering research and industry best practices in the highly specialized context of coaching teams in organizations. Your experience of the TCOS℠ will rapidly increase your competence and confidence to assess, design, and implement strategies to effectively coach teams real-time in organizations--and impact enterprise-wide change. Imagine a powerful live experience that gives you the opportunity to practice new skills to advance toward mastery so that you can return to their organizations to make an even bigger and better contribution toward supporting mission critical goals. Consider the optimized performance, the improvements in collaboration, and the efficiencies that can be realized when team members are coached to take on new ways of solving problems that can stay with them and your organization in a lasting way. These are among a couple of the powerful and profound outcomes from LSI's proprietary Team Coaching Operating System℠. It would be our privilege to bring it to you and your organization, optimizing your performance and those you serve. Get Dr. Laura's Tips to Consider When Coaching a Work Team. Sign up for the Leadership Strategies International newsletter for the latest research and team coaching educational opportunities. Call 661-251-0641 today or email [email protected] now to get on Dr. Hauser's calendar. Let's talk about what it would take to green light this powerful team coaching system in your organization. WHAT DOES THE TEAM COACHING OPERATING SYSTEM℠ INCLUDE? Integrate the Team Coaching Operating System™ framework into your daily and long-term strategic work. Bonus! Access to assessment tools for use with your teams including the NEW Everything DiSC Productive Conflict Profile. Call for a personal consultation to see how LSI's Team Coaching Operating System℠ may be a fit for you. Sharpen your competence and confidence to design and implement interventions that are most effective to producing positive outcomes during the beginning, middle, and end of a team’s performance cycle. The Team Coaching Operating System℠ was developed by Dr. Laura Hauser. 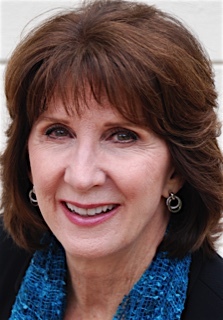 She is internationally recognized as a thought-leader in the highly specialized context of work team coaching. Through publishing, consulting, teaching, and conference speaking, she leverages her business expertise and research to shape the current and future practice of team coaching. Dr. Hauser serves as President of the Graduate School Alliance for Education in Coaching (GSAEC.org), setting platinum standards for graduate-level coach education and research. And she serves as faculty for Fielding Graduate University as well as Royal Roads University. We have trained an elite group of leaders and coaching professionals who support the TCOS program through individual and group supervision. The Team Coaching Operating System℠ is designed for experienced leaders, coaches, and consultants who want to expand their capability to move beyond coaching individuals to coaching teams. The ideal participant in the TCOS℠ is: 1) a leader of teams who work in mid-size to large organizations, and 2) an internal Human Resources, Organization Development, Talent Management, or other experienced professional who is responsible for the develop leaders and teams. The program is designed for delivery onsite to your internal leaders and/or professional staff such as HR, OD, Talent Management professions onsite at your organization's location. In addition, Leadership Strategies International partners with individuals who want to organize and host a public course. Contact [email protected] to learn more. Do you want to bring the course in-house through their education assistance program as a continuing education course? We can do that for you. Leadership Strategies International partners with Fielding Graduate University, a regionally accredited university, to host the Team Coaching Operating System™ foundations program. Contact [email protected] about how to take advantage of this option. Get on Dr. Laura Hauser's calendar now for a free 30-minute consultation about how to increase your knowledge, skills, and competencies to improve the effectiveness and performance of teams. Send an email to [email protected] this in your subject line, "Request a TCOS call with Dr. Hauser".